Show is on until 24th February. More info at the Lumen Studios site. 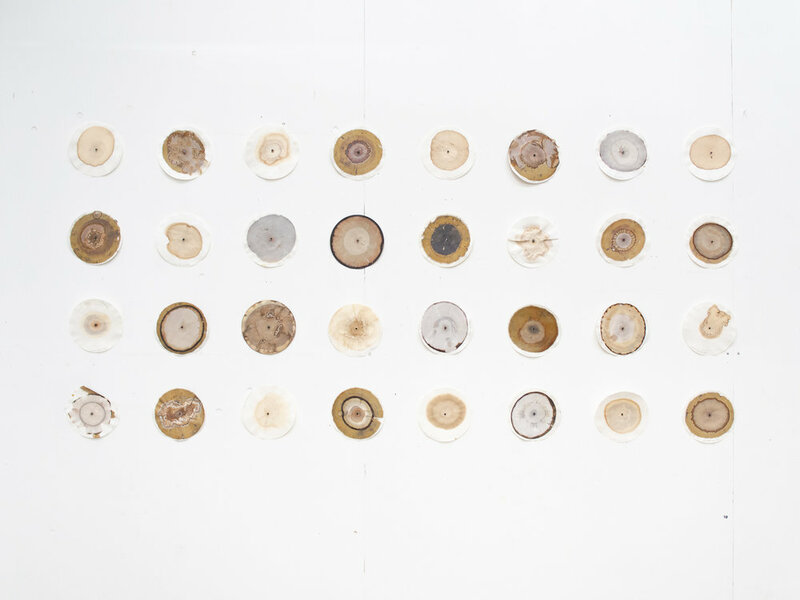 These works by Hannah Fletcher are reminiscent of tree rings but are actually chromatograms of soil samples collected from around tree roots. While tree rings are the way we look at the history of a tree, a snapshot of its life, these works seem almost like portraits of possible futures. The minerals around a tree’s roots may have found themselves absorbed by the tree eventually, affecting and influencing its growth, but here they are diverted and exposed to us like small forks in time. Each one also acts a sort of miniature timeline where the central point marks a beginning, the starting point of the minerals within the soil sample, and the concentric rings around this become end points, the furthest areas to which each mineral travelled. The cumulative effect is like a collection of endings. Hondartza Fraga’s pieces play with the contrast between the quality of marks and the imagery they portray. The drawings could be pencil, certainly handmade, but they depict images of a planet in distant space, almost like they were made long ago by a traveller before the advent of photography. We are so used to seeing this imagery in a digital context, and to rerender it physically by hand is like giving body to the digital, almost like imbuing material objects with some sort of ghost or spirit that has been restlessly shooting through wires in the form of light and energy, endlessly duplicated but always searching for a material to inhabit, a place to rest.